Which Bank Stocks Does Warren Buffett Own? The Oracle of Omaha has shares of six banks in Berkshire Hathaway's portfolio, with a seventh potentially on the way. Berkshire Hathaway (NYSE:BRK-A) (NYSE:BRK-B), the conglomerate led by Warren Buffett, has a portfolio of dozens of common stocks that is closely watched by many investors. Bank stocks make up a particularly large portion of the portfolio, currently accounting for about 11% of Berkshire's entire market cap. Here are the six bank stocks in Berkshire's portfolio, as well as one more than will most likely eventually become a part of it. Source: Berkshire Hathaway SEC Filings. Current as of 12/31/2016. Wells Fargo has been a Buffett favorite for years, as the bank does a fantastic job of managing risk and running an efficient banking operation. Even after last year's "fake accounts" scandal, which Buffett acknowledged was a big mistake, he still refers to Wells Fargo as an "incredible institution." Berkshire's Wells Fargo stake represents just under 10% of all the bank's outstanding shares, and about 6.5% of Berkshire's entire market cap. 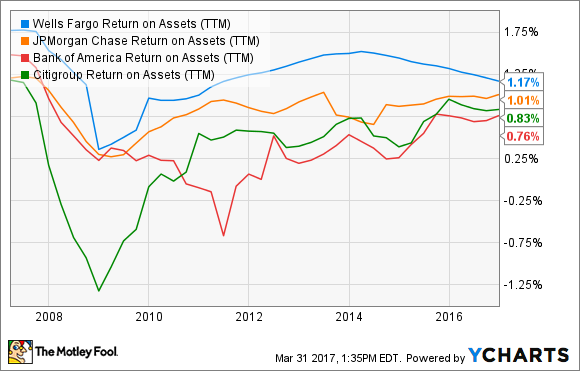 To understand why, just take a look at Wells Fargo's return on assets (ROA) as compared with the rest of the largest U.S. banks over the past 10 years. Although it's not technically a "bank stock", credit card issuer and payment processor American Express does engage in many banking-related business activities, and is one of Berkshire's largest investments, so I felt it was important to include here. American Express is among Berkshire's five largest stock investments, and he hasn't sold a single share, even after Amex lost its Costco partnership and faced unfavorable legal decisions. Berkshire owns about 16% of the credit card giant, and has repeatedly praised the company's talented management team, as well as the competitive advantages of American Express' closed-loop payment network, valuable and well-regarded brand name, and the most affluent base of cardholders among any of the major issuers. At first glance, U.S. Bancorp is an expensive bank stock. In fact, the bank trades for 2.1 times its book value, by far the highest valuation of any of the bank stocks on this list. However, Buffett doesn't need his stocks to be cheap, he just wants to find great companies at fair prices, and with U.S. Bank, you certainly get what you pay for. The bank is one of the most profitable and efficient operations in the entire banking industry, even topping "rock solid" heavyweight Wells Fargo. Berkshire's investment in Goldman Sachs began during the depths of the financial crisis, when Buffett agreed to a $5 billion deal to buy that amount of Goldman Sachs preferred stock with a 10% annual dividend, as well as for warrants to buy an additional $5 billion of Goldman Sachs common stock for $115 per share (the price is approximately double this amount today). The preferred stock was redeemed in April 2011, and Berkshire traded in its warrants for 43.5 million shares of Goldman, about three-fourths of which have since been sold, as you can see in the chart at the top. Although it's a relatively small investment compared to some of the others on this list, Bank of New York Mellon is still one of Buffett's favorite banks. In fact, Berkshire added to its position in the bank in 2016, increasing its stake by 3.6%. Simply put, Bank of New York Mellon has a strong balance sheet and has been a consistently strong performer over the years (it was founded in 1784 and is America's oldest continuously operating bank). In addition, the bank has a highly diverse revenue stream, specializing in private banking, asset management, and institutional services. M&T Bank is a large regional institution headquartered in Buffalo, and has been a part of Berkshire's portfolio for more than two decades. The bank has been highly profitable relative to peers (see a pattern forming here? ), and Buffett has tremendous respect for the bank's CEO and management team, which has grown the bank through decades of smart acquisitions. As a sidenote, I can't emphasize enough how much weight Buffet places on quality management. He literally believes that the right managers can add tremendously to a company's intrinsic value, and therefore should be an important piece of the puzzle to evaluate when choosing stocks. No discussion of Warren Buffett's bank stocks would be complete without mentioning Bank of America (NYSE:BAC). To be clear, Buffett doesn't own shares of Bank of America -- not yet, anyway. However, as the result of a savvy investment Buffett made in the wake of the financial crisis, Berkshire owns warrants to buy 700 million shares of the bank for just $7.14 (Bank of America's share price is $23.85 as of this writing) at any time before September 2021. In recent shareholder letters, Buffett has all but told investors that Berkshire intends to exercise these warrants and finance, it's just a matter of when it will happen.